Art Bridgman and Myrna Packer’s “Memory Bank” uses custom time-delay software to make recorded images interact with the live dancers in a way that, according to Bridgman/Packer Dance, creates an “alchemy of living form and virtual image.” As their real and recorded selves are “mixing, swirling, interfering and colliding with each other,” past and present seem to meet. The software, developed by Matthias Oostrik, is one of the inventive ways the company integrates video technology in its choreography — a concept it calls “video partnering.” “Memory Bank” is one of three pieces featured in “Out of the Box,” a show composed of selections from the full-length works that make up the company’s “Trilogy.” Bridgman/Packer will perform “Out of the Box” at 7:30 p.m. Tuesday, Jan. 25 in Murchison Lane Auditorium at Sweet Briar College. Bridgman and Packer’s works “Seductive Reasoning” and “Under the Skin” are also featured in the show. Each piece is distinct in its integration of real and virtual. 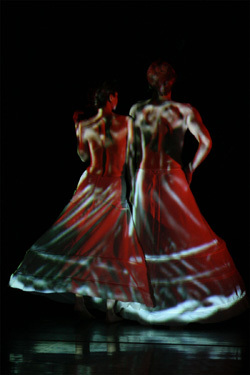 The performers variously become projection screens, multiply on stage and interact with themselves as well as each other, and seemingly morph before the viewers’ eyes. In “Trilogy,” “Evocative transformations play out in sensuous, intensely physical partnering and surprising shifts of scale,” the company writes on its website. Original musical scores by composers Robert Een, Ken Field and Glen Velez accompany the works. Tickets go on sale Monday, Jan. 17. Admission is $10 for adults, $7 for seniors, $5 for students, and free for children younger than 12 and for members of the Sweet Briar community. Call (434) 381-6120 or e-mail boxoffice@sbc.edu to reserve tickets. Credit card orders can be placed starting Jan. 17 at www.lynchburgtickets.com. For more on Bridgman and Packer, see Casey Gillis’ story in the Lynchburg News & Advance.